The Sunday Paper returns thanks to Brian Panizzi. He sent his write-up to UofMUSCLE@gmail.com and, thankfully for me, he followed the guidelines. Thanks Brian! My name is Brian Panizzi. I have been collecting and recollecting toys for 15 years. When I was a kid I had probably purchased/received either a couple of 4 packs or a 10 pack. I did not have many of the figures, and the only dude I remember having was made of bricks with the sun symbol (I know this is Sunshine now) but I cannot remember which version it was. It was one of the humanoid versions, I know it was not BHS, regardless of what my “rocket firing Boba Fett” memory tells me. I really only got into recollecting M.U.S.C.L.E. in the last two years with most of it being “Oh hey look there is a M.U.S.C.L.E. dude” while at a flea market. About 6 months ago I bought a bag full of sculpts I had never seen and I started looking for more information on the figures (who they were, were they official). It was through this research that I found UofMUSCLE. I was initially frustrated because I just wanted the quick answers, but then I read an article and of course it made reference to a former article so I read that article, which started a spiral. I loved that the site was set up to be something you could get lost in. Which kind of reflects how I am dealing with M.U.S.C.L.E. I had no idea there were so many different characters and sculpts. I am still finding sculpts I did not know existed while reading the site. I did not know that the originals had a wave 2 that was colorful until I happened across one, which I was skeptical of being a legitimate M.U.S.C.L.E., since I had already come across a few Bootlegs and Knock-offs. Funny side note, my wife and I went to Japan a few years ago and went to an awesome shopping arcade named Nakano Broadway in Tokyo. If you are unfamiliar with it, it is a 4 story mall full of pop culture stores and includes several stores from Mandarake. One of the stores sold nothing but little rubbery eraser like figures, I had not learned the term ‘keshi’ yet. Looking in the store I found 5 gallon tubs full of figures using the M.U.S.C.L.E. sculpts marked 100 Yen (less than a $1) a piece. Given the price and the eraser material, I wrote these off as knock-offs. Yes, I kick myself every time I think about it. I have around 100 different figures now with none of them being non-poster. I lucked out and found a Wrestling Ring loose with the rope and the stickers still in decent shape at an antique store. My favorite color is purple so I find myself drawn to all the figures in that color. I was bummed to find out that none of wave 2 colors carry through the whole line, as I would love to have a full wave in just purple. My favorite figures are #148 Flasher Balloon and #101 Lion Man, who I named Ookla, after the sidekick in Thundarr, the Barbarian. I do not think I will try to get everything out there, as that seems nigh-improbable, but I definitely would love to get at least one of every poster figure, regardless of color, a Satan Cross, and one of the cans. The one criticism I have is that the original color has become known as ‘flesh’. I understand where it comes from, but I always refer to it as ‘eraser’. It is not something I expect to change, but as long as I do not get blasted for calling it ‘eraser’ or ‘eraser color’, I can deal with it. This entry was posted on Sunday, May 6th, 2018 and is filed under UofM News. You can follow any responses to this entry through RSS 2.0. You can skip to the end and leave a response. Pinging is currently not allowed. Cool read. Thanks for sharing, Brian! 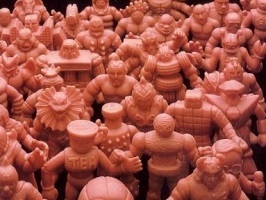 For years, Kinkeshi in the original eraser color were referred to as 肌色, or “flesh color,” by Bandai. Recent Bandai Kinkeshi releases, however, are being advertised as Pale Orange instead.